The Zurich SEO Expert optimizes your web pages to rank in Google in a short time. My well-thought SEO strategy works in any Swiss region and produces fantastic results. Hire me to outrank your competition now. I will put my ten plus years in SEO into building landing pages that produce first-page rankings. All my pages abide by the Google guidelines (White-hat) and spam-free. 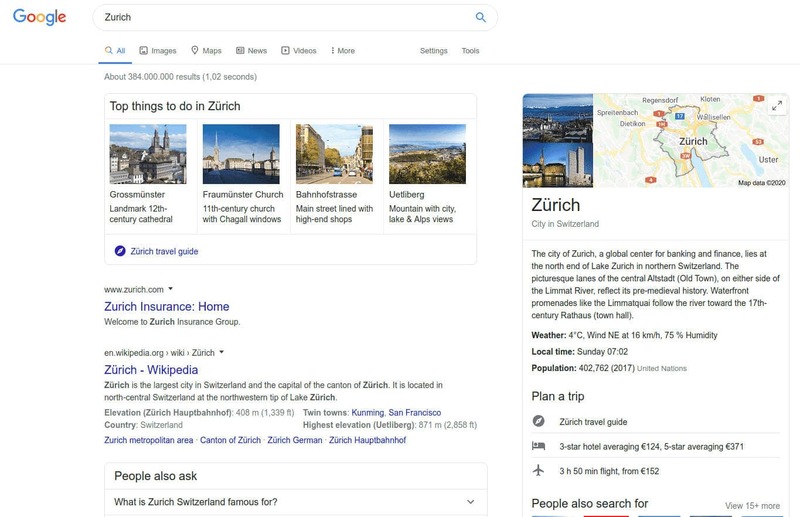 I have devised a unique SEO strategy that ranks pages in Zurich and other locations or regions. My pages use advanced SEO tactics and can rank with no backlinks in some niches. Take any niche, and I will make sure nobody beats my landing pages. I like to exploit all content opportunities and generate leads from different platforms. These may include Google search, Google Maps, YouTube, etc. The SEO performance of my landing pages leaves few chances for competitors. You can now focus on growing your business and stop running behind your competition. Let me work your pages for six months, and you judge if the results work for your business. Add more than six months to your calculations if you market in a competitive niche or have a penalized site. Ask for my quote using the form below. My goal is to position your website as the top performing in your niche. The others can spend their money on useless backlink packages and Google Ads. Vane efforts to create traffic when there is abundant free (organic) traffic. These packages can only generate thousands of backlinks, what breaks SEO. Instead, I like to work with low-impact tactics that grant fast and permanent results. Google is not keen on giving out information about its search engine updates. When an update occurs, most SEO consultants cannot react and fix things. This way Google can impose changes on a massive scale. Engine updates, penalties, and demotion of rankings hit millions of webmasters. I build pages that play along with Google and not fighting its algorithms. Most of the time my pages rank higher after such changes. Many times my pages rank with zero backlinks. Their superior quality facilitates such rankings. Most of your competitors do not understand how SEO works and only do experiments. Instead, I like to put many hours into building the best landing pages in the market. My landing pages will help you reach your marketing goals. Stop experimenting with SEO, be confident of their performance. Follow the changes and see that in the end, they bring only positive things.